Furse was laid down by the Consolidated Steel Corporation at Orange, Texas on 23 September 1944, launched on 9 March 1945 by Miss Eugenia A. Furse, sister of Lieutenant Furse and commissioned on 10 July 1945. Furse sailed from Norfolk, Virginia 7 November 1945 for occupation duty in the Far East, calling at San Diego, California and Pearl Harbor en route to Tokyo Bay, where she arrived 22 December. After acting as courier between Nagoya and Wakayama, she conducted training operations out of Kobe, then sailed back to Pearl Harbor to prepare for participation in Operation Crossroads. In this operation, atomic weapons tests in the Marshall Islands during the summer of 1946, Furse acted as plane guard to carriers of JTF 1. The destroyer returned to San Diego 12 August 1946, and until her transfer to the Atlantic Fleet in April 1949, operated on training along the west coast, and completed another tour of duty in the Far East. She was reclassified DDR-882 on 18 March 1949. She arrived at Newport, Rhode Island, 21 April 1949. On 10 September, she sailed on the first of her tours of duty with the 6th Fleet in the Mediterranean Sea, which were annual, aside from 1951 and 1959, through 1960. From January 1951, Furse was homeported at Norfolk. (Home port from 1959 to 1962 was Charleston SC.) Early in 1963 "Furse" was in the Shipyard in Philadelphia for FRAM overhaul. Among the highlights of the destroyer's operations were visits to ports of northern Europe between September 1950 and December, during which she represented the United States at the funeral of King Gustav V of Sweden. From 1952 onward, she often served with the Operational Development Force, perfecting techniques in antisubmarine warfare. A midshipman summer cruise in 1952 again took her to ports of northern Europe. The USS Furse also participated in Med cruises in 1953 and 1954. Marking her 1956 tour of duty in the Mediterranean was her participation in the evacuation of Americans from Israel and Egypt during the Suez Crisis, and lengthy patrol duty in the eastern Mediterranean. The next year, she made two tours of duty in the Mediterranean because of the tense political situation prevailing, and in the summer of 1958, she sailed for NATO operations in northern waters, visiting Santander, Spain; Stavanger, Norway; and Ghent, Belgium. In the periods between her deployments, Furse carried out the intensive training schedule of Destroyer Force, Atlantic Fleet, cruising the east coast and the Caribbean in operations with ships of all types and major fleet exercises. "During June 1965 FURSE was a unit of recovery force for the fourth Gemini astronaut space shot. In the winter of 1967, FURSE spent time in the Boston Naval Shipyard receiving her regular yard overhaul period in preparation for a WESTPAC cruise in the summer of 1968. Shortly after her yard period, she took part in refresher training in Guantanamo Bay, Cuba followed by Fleet exercises in the Atlantic and Caribbean." My recollection is that we were steaming in a line with another destroyer on a normal shore fire bombardment run within about a mile of the coast. This normally entailed about 20-30 seconds of staying on a constant course at a constant speed for the computer to stabilize and generate firing solutions for the director and mounts. The North Vietnamese had set up bamboo stakes at regular intervals as visual references to track the course and speed of our ships to assist in their own firing solutions. I was in CIC as Gunnery Liaison Officer with communication to Tom Reid in the director. I heard some popping sounds and the word came from the bridge that rounds from a shore battery were falling around us-reportedly a number of rounds had bracketed us and were falling almost vertically. Tom's voice was excitable as he directed counter battery fire against the shore. Then there was a report of a hit near Mt. 52. Shortly the popping stopped and we turned away to steam out of range of shore guns and eventually secured from General Quarters. Three sailors from the damage control party stationed below the hatch at the corner of the hangar deck which had taken the hit were taken to the wardroom to receive medical treatment. Only one was seriously wounded as I recall. After we secured from GQ I and others went back to the hangar deck and saw the hole where the round had penetrated--right where the damage control party was standing. The hangar deck and door were peppered with small holes and I managed to pick up a piece of the shrapnel as a souvenir. The captain was particularly anxious about the damage because an oriental rug he had bought in Hong Kong was stored along with other purchases by the crew in there. En route to San Diego, the Furse traveled through the Panama Canal. Although we were out of the war zone, we faced a final challenge: the fresh water killed the barnacles on the ship’s hull, causing an unexpected leak beneath the #4 boiler. We had to quickly improvise, creating a breathing apparatus from a gas mask and pump, which allowed a crewman to swim under the hull and put a temporary plug in the leak. My memory of my Vietnam experience includes moments of fear as well as camaraderie with fellow officers and sailors. There were also moments of humor and enjoyment. One event that comes to mind is recreation on the beaches and catching passes from Annapolis grad Roger Staubach, who would later return to the U.S. to become a star quarterback for the Dallas Cowboys. Furse was decommissioned on 31 August 1972, and stricken from the Naval Vessel Register on 2 June 1975. She was transferred to Spain and renamed Gravina. Gravina was scrapped in 1991. 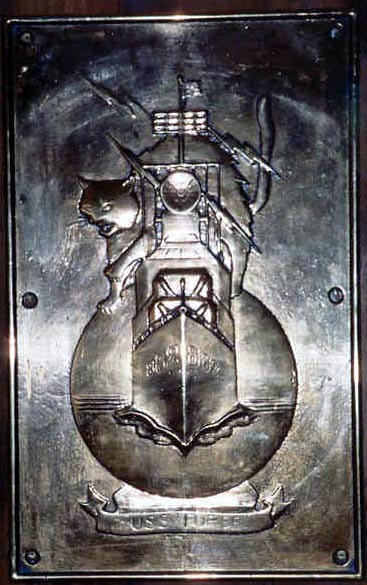 One of the ship's two quarterdeck brass plaques is now in the custody of Battleship Cove in Fall River MA., in hopes it will be displayed in their Destroyer Museum on the USS Joseph F. Kennedy DD 850.